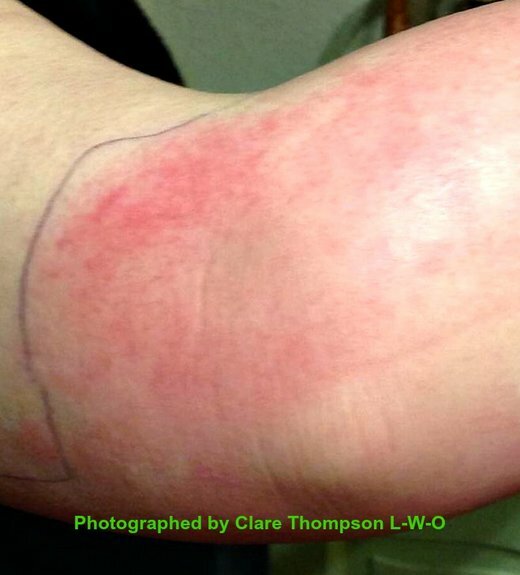 Welcome to our L-W-O page on Cellulitis. This page and its photographs are supplied by L-W-O members. The drop down menu at the top of the page has information on The Lymphatic System. For those of us that have lymphoedema we need to protect ourselves from inflammation and whilst this will seem like common sense to most of us, I have spoken to people who were never told about the risks. The tips and advice on this page are designed to help you the reader cut your risk of cellulitis. 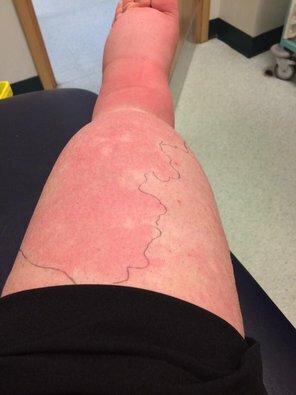 Cellulitis is a sudden, non-contagious infection of the skin, characterised by redness, swelling and heat, accompanied by pain and tenderness. People with lymphoedema are particularly susceptible to cellulitis because the lymphatic system is damaged and frequently does not function adequately to fight infection. The infection may enter via a break in the skin, such as a scratch or insect bite or through a re-existing wound or ulcer, or through an area of skin inflammation, e.g. athletes foot, eczema or dermatitis. However, it may not be possible to identify the cause and an attack may arise without warning. How can I recognise Cellulitis? The patient often feels unwell, as if 'flu' is starting. 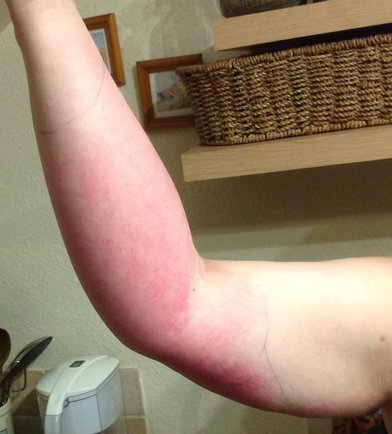 The swollen area usually develops a rash or becomes red, hot and tender to touch. Swelling may dramatically increase and pain may occur in the swollen area, or the arm pit, with lymphoedema of the arm, or groin with lymphoedema of the leg. I cannot emphasise enough the importance of taking your temperature. 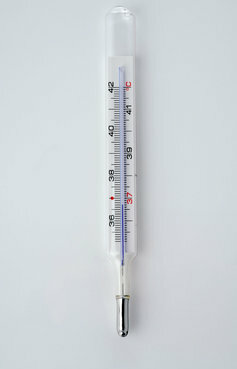 From the start your temperature can rise very quickly so it is important to keep a thermometer at home. If you have had cellulitis ,then it is highly likely that you will get it again. Unfortunately, it is not always possible to prevent it from coming back. Therefore, you need to take your own preventative measures. ​​Please remember athlete's foot, eczema and leg ulcers can increase your risk of cellulitis so if you have any of these conditions please talk to your GP. Unfortunately, if you carry extra weight you can increase your risk of cellulitis. ​Speak to your GP if your cellulitis comes back or is not healing as your GP will have the option to refer you to a dermatologist, or skin infection consultant. You can then discuss whether there is an option to take antibiotics on a long-term basis to protect from further infections. 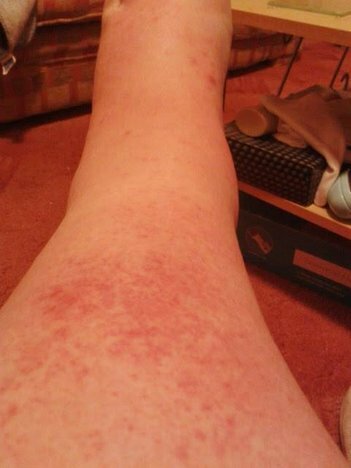 This is photograph from L-W-O member Clare, reproduced with her permission and is the start of her cellulitis infection. You can see the faint lines of the marker pen that Clare used to map the journey of her infection. See also Clare's second photograph. Contact your GP immediately as you will need antibiotic treatment. Treatment of cellulitis in lymphoedema is very important, not only because you might become very ill, but because lymph drainage routes risk being damaged further. L-W-O recommends that in case of infection mark the infected area with a pen/marker so that if it spreads quickly your GP or the hospital can see how far it has spread. See both Clare's photographs. Oral amoxicillin 500mg 8-hourly is the treatment of choice. If there is any evidence of Staph aureus infection e.g. folliculitis, pus formation or crusted dermatitis, then flucloaxcillin 500 mg 6-hourly should be prescribed in addition or as an alternative. Microbiologists suggest that the use of a single agent flucloaxcillin for all cellulitis covers both Strep and Staph, infections. This is therefore, an acceptable alternative. Patients who are allergic to penicillin should be prescribed erythromycin 500mg 6-hourly or clarithromycin 500mg 12-hourly. If there is a poor response (unresolving inflammation or development of systemic symptoms) or oral amoxicillin after 48 hours, then clindamycin 300mg 6-hourly should be substituted as second line oral treatment. Antibiotics should be continued until all signs of acute inflammation have resolved; this may mean taking antibiotics for 1 - 2 months and the course of antibiotics should not be less that 14 days from the time a definite clinical response is observed. Skin changes e.g. discolouration/staining may persist for months or longer following severe cellulitis and do not necessarily require ongoing antibiotics. Appropriate analgesia e.g. paracetamol, as necessary. It is probably advisable to avoid NSAIDS e.g. ibuprofen during an acute attack. On occasions these medications may be associated with rare complications such as necrotizing fasciitis. When inflammation is sufficiently reduced, wearing of compression garments and normal levels of exercise may resume. A return to work depends on the patient's occupation, and there being no deterioration when normal levels of exercise are established. Unusual circumstances, e.g.. animal bite or lick preceding an attack, or a failure of infection to respond to the above recommendations, should prompt discussions with a local microbiologist. If your cellulitis returns, then in it makes sense to have an emergency supply of antibiotics. Unfortunately, some GP's are reluctant to hand out emergency supplies. The risk of cellulitis returning once you have had an attack is high, therefore you should carry a two-week supply of antibiotics, especially if you are going on holiday or travel away on business. Start antibiotics immediately if you have symptoms. Always get a professional diagnosis. Protect your skin from the sun by using sun cream with SPF of at least 30. We all tend to know the temperature of water in our own homes, but when staying with family or friends be extra vigilante. I find the hottest water temperatures are when I stay in hotels or on holiday. Use unaffected hand to test water temperature because there might be little or no feeling in your affected hand. Too much heat can increase swelling so test the water before a bath or shower. Especially when you are away from home. When you are out and about and you go to the toilet you will hopefully wash your hands after; the water from the tap can be scalding. Sometimes you will find a notice telling you to be aware that tap water is hot but in most cases there isn't. Avoid hot tubs, saunas, hot tubs and steam rooms. Don't sit to near too a fire or heat source. 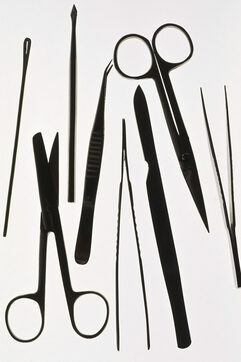 Use nail clippers instead of scissors so that you are less likely to nick the skin. Don't push back or cut your cuticles. If you do have a professional manicure, make sure that salon hygiene is good. Make sure the product used is a reputable one. For someone living with lymphoedema most of the above tools are something you would not want to be poked and prodded by. I could not have written this page without the help and support of The Lymphoedema Support Network (LSN). Information on this page, has been reproduced from Mary Ann Evans Hospice, Newsletters and BLS & LSN's, fact sheet, "Management of Cellulitis in Lymphoedema". The LSN information was produced and verified by accepted experts in their field and reflects current practice. I have added tips, advice from myself and L-W-O members and I am grateful to our members for their input and photographs. The information that I have written, has been designed to assist you in managing your lymphoedema and not intended to replace advice you may have recieved from your health care practitioner. Please read the Medical Disclaimer at the bottom of this page. The above photograph was taken by an L-W-O member, reproduced with her permission. Clare has used a marker pen so that she can show her health care professional how the infection has spread. It is so important to look after your skin when you have lymphoedema. Keep your skin clean and moisturized. When you are sitting or lying down L-W-O recommends that you can elevate your limbs so that the lymph fluid can drain. Arm lymphoedema - sitting in a chair, put a cushion or pillow under your arm so that your arm is elevated. Leg lymphoedema - sitting in a chair use a stool or chair to raise your leg. Lying in bed - put your leg on a pillow, but do not put it higher than your head. Head and neck lymphoedema - use 2 or three pillows to raise your head this allows the lymph fluid to drain. Thank you to L-W-O member Jessica Snee for allowing me to use this photograph. injections or IVS to your affected side. invasivive procedures to your affected side. using the arm for long periods as vacuuming, ironing, driving and gripping can all make your condition worse. Ironing and vacuuming often take a terrible toll on my arm. Carry a medical alert card or wear one of L-W-O's wristbands. Living with lymphoedema means that you are only ever one bite or cut away from a serious infection. Often resulting in cellulitis. 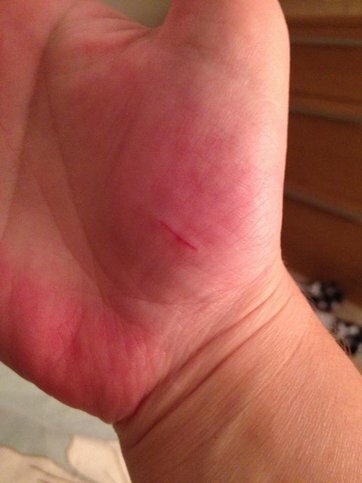 Always protect the skin on your hand/arm/leg to avoid cuts and scratches. The above photograph is from L-W-O member Lorraine Twinn. If there is no or a poor response to this regimen after 48 hours, clindamycin 600mg 6-hourly iv should be substituted. For the treatment of ano-genital cellulitis the recommended first line treatment is amoxicillin 2g 8-hourly iv plus gentamicin 5mg/kg iv daily; dose to be adjusted according to renal function and assay. NB: Local hospital guidelines may differ from this. Monitoring of CRP / ESR / WCC / temperature is recommended and microbiology of any cuts or breaks in the skin before antibiotics started. Blood cultures may be appropriate. Extent and severity of rash – if possible, mark and date the edge of the erythema (may be difficult in lymphoedema as the rash is often blotchy). 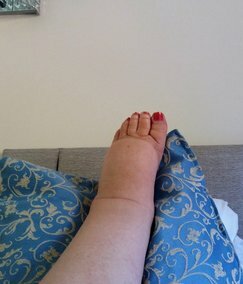 This is how lymphoedema developed in the leg of L-W-O member, Lisa West. See how she has mapped the spread of the infection with a marker pen. Handle pets that might scratch carefully. 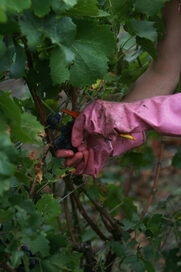 The advice is to wear long sleeves, as well as gloves and trousers for legs. Use an electric shaver not a razor for removing unwanted underarm or leg hair. No waxing or sugaring to remove unwanted hair. Always try a small test patch before using hair-removal creams. Avoid wearing tight elasticated cuffs like those you would wear when doing a sports activity. Avoid wearing tight jewellery especially bracelets, rings and watches, including ankle bracelets or toe rings. Avoid tight bra straps and tops with tight armholes. Avoid tight clothing around the groin area. Do not carry anything heavy, such as bags of shopping this could lead to muscle strain and make swelling worse. Do not carry a shoulder handbag on your affected side. 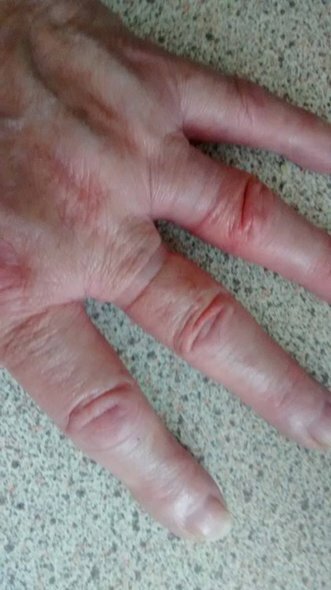 Photograph of L-W-O member Christine Watson's fingers when her rings got too tight. The indentations are clear to see. Often you can slip your rings on easily, go about your day and suddenly your fingers start to swell, then you have difficulty getting them off. If you feel your fingers swelling, try to remove your rings as soon as possible. I often go without wearing rings, if they don't slip on then I don't put them on. Rebecca Elwell Abstract Presentations #BLSConf2018 on Red Leg Syndrome. 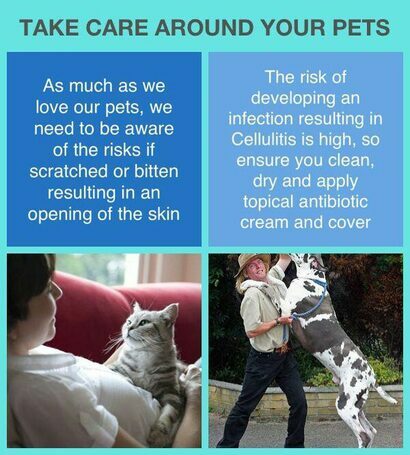 "Cellulitis is said to cost the NHS over 90 million each year. Approximately 40% patients diagnosed with cellulitis do not in fact have cellulitis but in fact have an alternative diagnosis of red leg syndrome. The symptoms of red leg syndrome include redness, pain, heat and skin changes but the patient is apyrexial and does not have systemic malaise. In order to ensure correct identification of red legs a pathway has been developed. It is hoped that this will reduce the number of patients receiving an incorrect diagnosis, inappropriate usage of antibiotics and associated health risks along with improving patient experience with timely, effective management of their condition. It is hoped that advice on how to manage red legs will eventually reduce the number of referrals received into the Red Leg Clinic. The next step is to launch the pathway into Primary Care; initially this will be done via GP Newsletters and then cascaded via the tissue viability, community and practice nursing teams." Further information on Red Legs can be found on the LSN website.